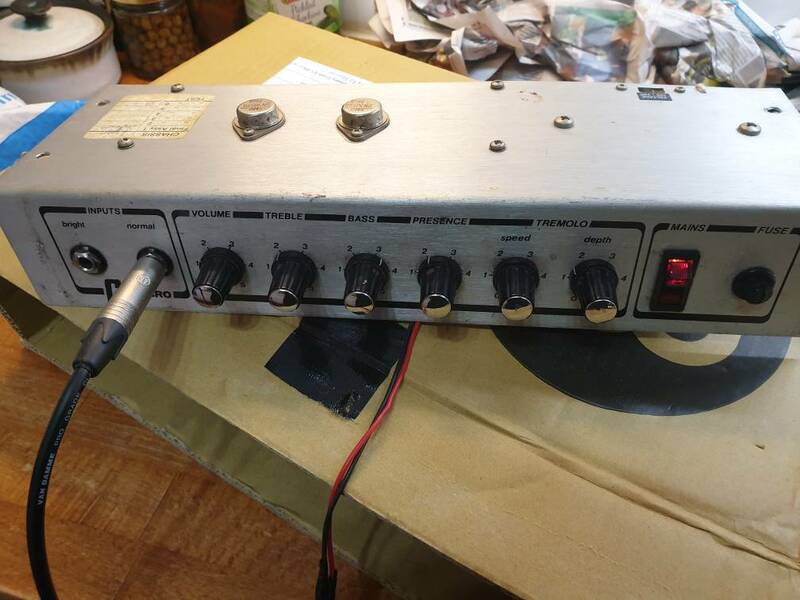 I have acquired an amp chassis (it was cheap as chips) to fiddle with. Apart from Carlsbro, there were no other identifying marks, but I have now determined it to be a Carlsbro Hornet from the late 70s. 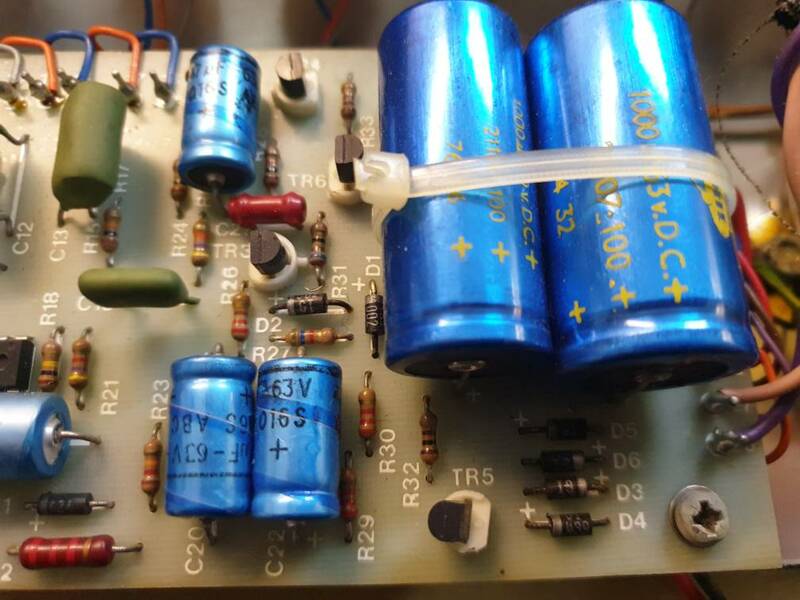 I have seen it described as both 30W and 35W but cannot find a schematic. The amp seems to work well (a bit slow and fizzy powering down) but is surprisingly loud and will make a good pedal platform. After checking for any loose or dried/charred components, I cleaned all the pots and they work well. However, the tremelo is slightly off. I was warned something was amiss, but it only has one usable sound with the depth control set at about 0.5. This provides a little shimmer. Above that, it gets a bit odd very quickly. It quickly seems to lose a part of the swell giving it a touch of the Norman Colliers. As I cannot find a schematic, can anyone suggest possible areas to check? 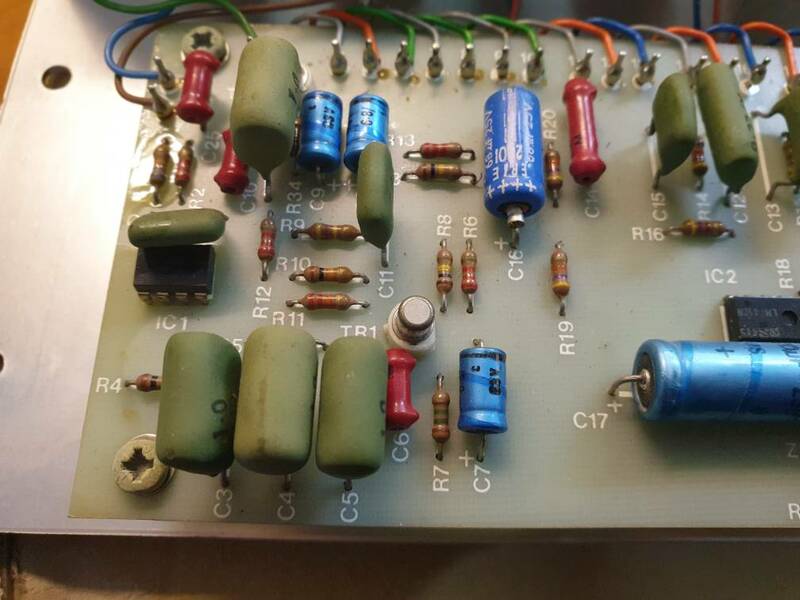 I assume it is the circuit with the tremelo components, but am at a loss to identify them. Also, I have only seen it as a vertical 2 x 10 configuration (pic attached) combo. I used a 1 x 12 to take the load at low volumes and assume the originals would have been 20W rated or similar. Is there a way to determine the right size speakers with so little information? And how does the speakers' impedence affect that calculation? The help I have received so far (and gleaned) has allowed me to sell on a load of old kit I had accumulated with guitar purchases. I sold the Gorilla for twice what it cost me. Another I got for a fiver went for just under £100, with a similar amount going to charity from those items alone. Most of this was simple cleaning, reattaching and a little soldering, but it was the strategy that helped. So far, the amount to charity is nearer to £250, so thanks to all who help. Just wanted to let you know others benefit from your assistance. 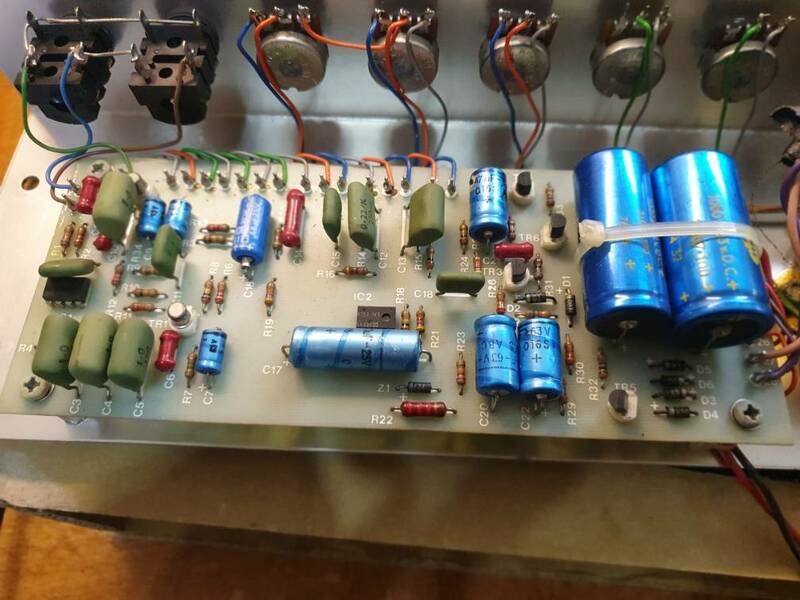 So you don't have this schematic, but if you can find other Carlsbro amps of the era, chances are the trem circuit is similar if not the same. 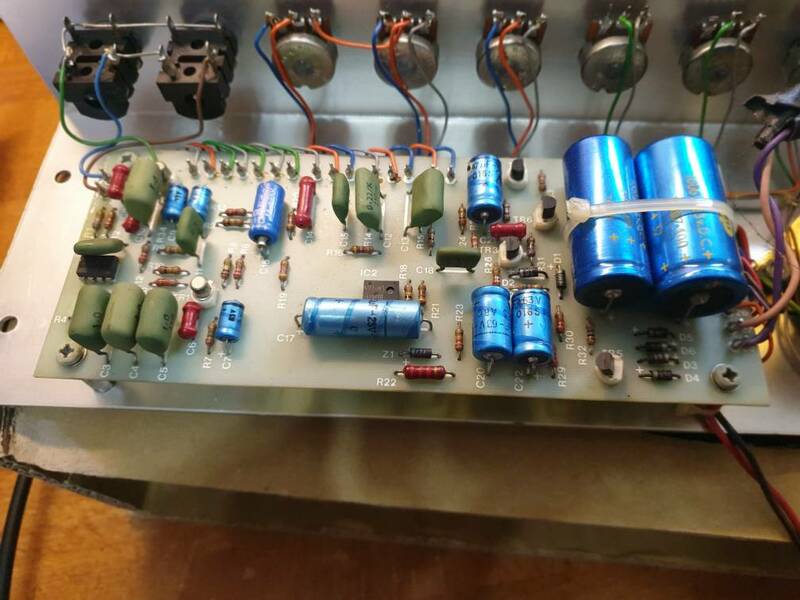 I have worked on quite a few SS amps from the 60's and 70's. I've found in all cases those amps benefit from replacing ALL of the electrolytic caps. I used to test them (caps) and leave them if they "seemed good" but the amp(s) would still have problems. If that amp were mine I'd start by replacing ALL of those blue tubular electro caps. C16 has popped,,so replace for sure. What's the bet that is part of the trem circuit. Thank you, Enzo. Struggling to find the same era.There seem to be plenty of the earlier and later valve amps or the later SS ones. But I'll take a look for the later ones and make a comparison. What an eejit. It so clearly has. Makes perfect sense. Nothing lasts for ever, after all. Thanks for your tuppence worth. Yep I know the feeling, my eyes also struggle to see fine detail. I don't even bother to try and fix anything that uses SMD's. 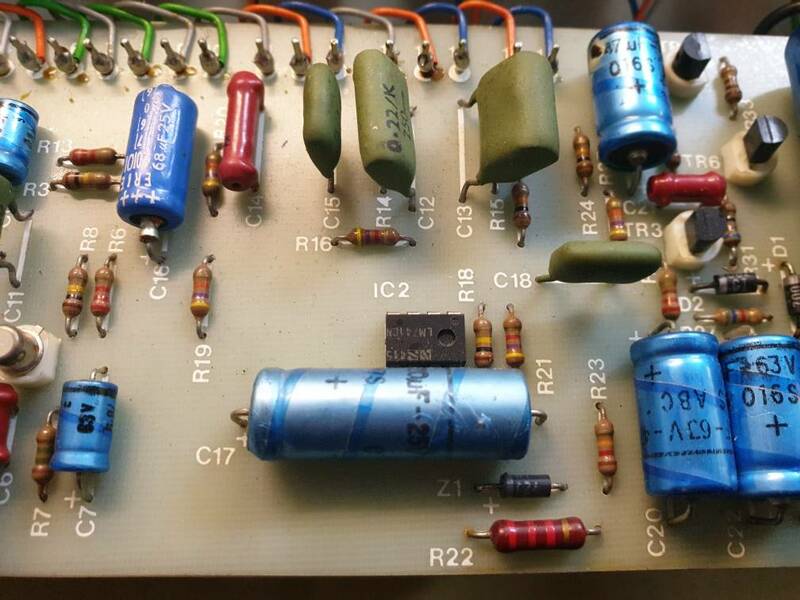 Only replace the obvious first and get the amp working,,, then go back and replace the others. If you shotgun the whole lot and it still does not work then you have no idea if you added yet another mistake. Yep, very good point. Fix the obvious first. Will do, Phil. Simple process of elimination far more sensible than having to pick the bones out of wholesale change. Thanks again.